Sandra Cordiner, First Aberdeen driver. 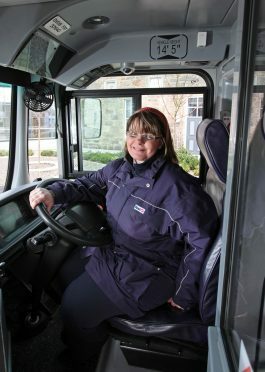 A north-east woman has been named as one the country’s greenest bus driver for the third time. Sandra Cordiner has been a driver with First Aberdeen for five years and this week received news that she had won the coveted title for her environmentally friendly driving – beating out 17,000 other bus drivers across the UK. The 44-year-old, from Peterhead, is one of 89 drivers to be recognised by the bus firm’s GreenRoad Fleet Elite awards. The drivers were measured on their DriveGreen performance. The scheme aims to provide passengers with a safer, smoother journey while also reducing the company’s carbon footprint. Ms Cordiner’s performance was described as “exceptionally good”. Last night, she said: “It’s really important to me that my passengers enjoy their trip on the bus. First Aberdeen’s managing director, David Phillips, added that he was “proud” of all of the company’s drivers. Last year, First Aberdeen unveiled a fleet of green buses to replace 10 diesel vehicles. The buses, valued at £21million, produce no harmful emissions and produce only water vapour at the tailpipe. They have proven to be almost four times more fuel efficient than their diesel equivalents.